Last week, I tried this recipe for the very first time and it was a success. I figured out it'd be nice to share with you. I was quite surprised how easy it was. Smash the cookies into very small pieces and mix it with the butter and milk. Stir it until you reach an homogeneous mix. Pour it onto a plate and let it rest while you prepare the rest. Put the gelatin leaves into cold water. Mix the cream cheese with the sugar until you get a nice and clear mixture. Whisk the cream with the lemon juice until they get hard (sort of whipped cream). Dissolve the gelatin leaves in hot water (approx. 3 table spoons). Let it cool down and then add it to the cream cheese mix. Add the whipped cream to the cheese mixture and gently stir them together. For the strawberry sauce, all you got to do is to put all the ingredients in a pan and let it cook in low fire. Once the strawberries get soft enough, pour it in the blender and that's it! Make it as liquid as you want and you're done! 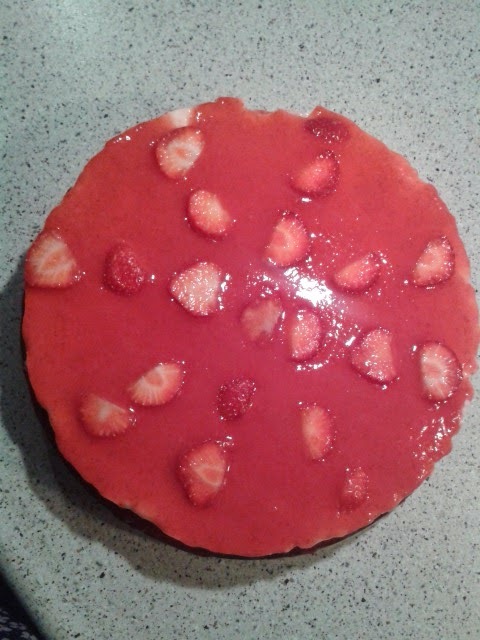 Before you serve the cheesecake, pour the strawberry sauce over it and voilá! Ready to go!!!! I forgot to add a side-view pic... Next time!